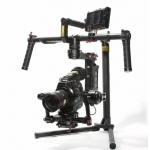 The Recoil is the ultimate balanced rig for the C300, Scarlet and Epic Cameras. With the Recoil concept, the camera sits directly on your shoulder like a typical ENG Camera. The Recoil is super light and stripped down (if you are looking for something even more stripped down, check out the Recoil Lite). The Recoil starts with our light Gorilla Baseplate. It attaches to the camera with 3/8” 16 and ¼” 20 screws*. The Gorilla Baseplate features 15mm diameter, 60mm spaced threaded rod holes in the front of the base plate that allow users to mount a follow focus, lens support or other accessories in front of the camera. 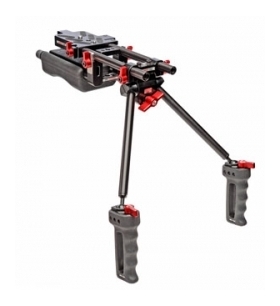 The Gorilla Baseplate is not compatible for matte box use unless you have a height adjustable matte box**. 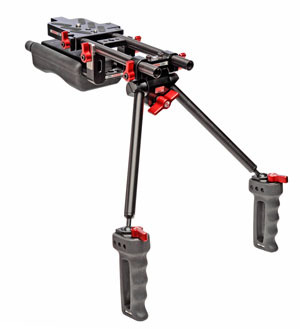 Unique to the Recoil is the use of the Zacuto Q-Release and Shoulder Pad. 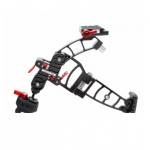 The Q-release allows you to mount the shoulder pad directly underneath the camera and be able to quickly release the shoulder pad from the rig by flipping two levers. 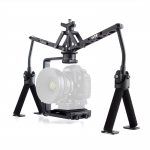 This gives you two things: the ability to quickly attach the rig to a tripod and vice versa, and the ability to have the camera sit directly on your shoulder eliminating the front heaviness. Coming off the front of the Recoil is our dual handgrip system, the Zgrips V3. The Recoil requires the use of an EVF. 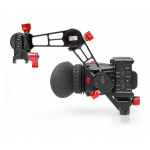 We recommend using the Z-Finder EVF Pro and the EVF Rod Mount to mount the EVF to the Recoil. The Recoil is a great kit for run & gun style or all day shooting with the EOS C300, C100, C500, Epic or Scarlet. It is an extremely versatile kit. 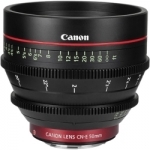 * NOTE: The screw hole pattern on the Gorilla Baseplate is ¼” 20, ¼” 20, 3/8” 16, 3/8” 16. The first ¼” 20 and 3/8”16 screw holes are for mounting the C300. The last ¼” 20 and 3/8”16 screw holes are for mounting the Epic or Scarlet.